This year Hunter is in the shark class! He could not wait for school to start. Maggie is in the Sea Turtle class and has 2 of the best teachers at Beltway. I am so glad she is in their class! I couldn't get Maggie to look at me. She was excited though! 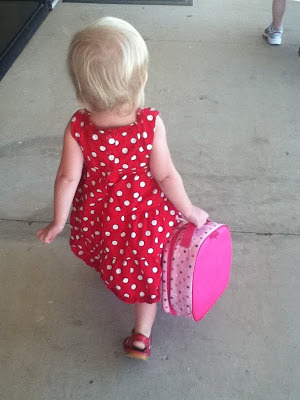 She didn't want to wear her backpack but wouldn't put her Minnie Mouse lunch box down. Maggie walking into the building. Maggie did awesome! She walked right into her class all by herself. She didn't cry at all! :) Such a big girl! 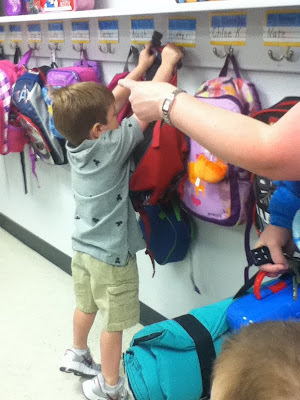 Hunter walked right into his class and hung up his backpack! He was so sweet! When I went to pick them up, Maggie's teaches said Hunter's class was playing on the playground at the same time and Hunter pushed Maggie on the swings. Isn't that sweet!! Maggie had a great day (or so they said) and she even took a nap on her nap mat! Yay Maggie! To be honest I was a little worried about Maggie because she was up most of the night on Monday. I don't know why, but she just did not sleep. Glad she still had a good day at school! Hunter told me all about his class when I picked him up. He loved music and loved making ants. He came home with a couple of work pages that he completed. He was so proud. He was also excited that he got to eat in the cafeteria (aka Kiddie Park). The oldest classes don't have to eat in their room like all the other classes. After school we made our traditional first day of school chocolate chip cookies! Yummy! I am so glad Maggie and Hunter both get to go to school this year. We LOVE Beltway and I can't wait to see what this year brings for both of them!